Mills, either water or wind, were the original ‘engines’, harnessing the power produced to do hard, tedious and monotonous work. They were, in fact, the first labour-saving devices. The technology of a mill’s mechanism to produce power has been known in this country since the late Roman period, but it was only from the Anglo-Saxon period that this knowledge was adopted with enthusiasm. During the Middle Ages, the mill belonged to the Lord of the Manor. All corn grown on the manor was required to be ground at the Lord’s mill, the miller deducting a proportion of flour or meal as payment for his services, and another proportion as the Lord’s fee or payment. In Dodderhill parish (which included Elmbridge and Crutch) we know from the Domesday Book, compiled in 1086, that there were 5 mills, presumably all of them grinding corn. Based on our current research, we believe that these were the sites of Paper Mill (at the west end of Paper Mill Lane), the first Wychbold Mill (at the west end of Mill Lane, south side), Impney Mill (within what is now the grounds of Chateau Impney), Briar Mill (to the north-west of Droitwich near the Kidderminster Road), and the Droitwich Town Mill (to the east of Chapel Bridge), all on the River Salwarpe. 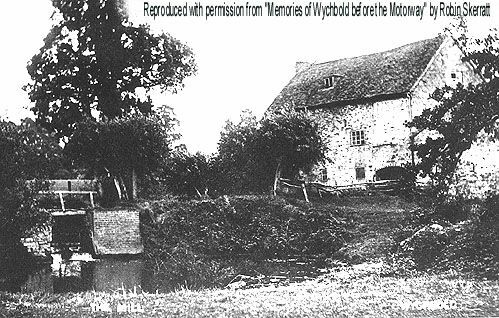 Paper Mill (its later name) was initially known as ‘Wychbold Mill’ when it is first recorded as being given to the nunnery at Westwood by 1175, possibly to distinguish it from the other mill which the nunnery also owned. It seems likely it was in existence in the previous century, and probably for some time beforehand. It is recorded in 1301 as marking the boundary of Feckenham Forest. After the Dissolution of the Monasteries in 1536-9 the lands and possessions of the nunnery passed to the Pakingtons and, probably because they were from Hampton Lovett, the mill site became a detached part of Hampton Lovett parish surrounded by Dodderhill. Thomas Lawe was the tenant at that time. By the late 17th century it had become a paper mill, as it was rented by Nicholas Clows who was already producing paper at Beoley Mill in Redditch. Paper was made from rags which were handsorted and cut into small pieces. The pieces were then boiled in open tanks, rinsed in shallow tanks and ‘disintegrated’ by being pounded for several hours. The resulting pulp was then diluted into a consistency known as ‘stock’. A wire mesh held in place by a removable wooden frame would be dipped in a vat of ‘stock’, the water would drain away and the wet fibres would form a sheet. A pile of wet sheets were sandwiched together between absorbent woollen felts and submitted to considerable compression. The sheets were removed to a drying loft before being sorted, checked and counted into reams (480 sheets each). The first Wychbold Mill, on the south side of the end of Mill Lane, was granted to Haughmond Abbey in Shropshire between 1172 and 1186, and again it seems likely that it had been in existence for some time before then. In 1395 a document makes reference to building a new house there. By the 1460s it seems this mill had gone, but at the same time there is a lease by Haughmond Abbey of the site to the north of this mill, suggesting that a second Wychbold Mill had been built there, still to grind corn. (Evidence survives on/in the ground of both mills.) The tenants, Richard and Joan Lawe, are also required to build an ‘insethowse’ (a small hall house) on the toft (garden), and this is thought to be Mill Cottage. The Lawe family remained as millers there through to 1620, and Thomas Lawe was also the tenant here at the time of the Dissolution of the Monasteries. By 1785 this ‘Wychbold Mill’ was known as a needle mill. Needle making was very much a ‘cottage’ industry centred on Redditch and its surrounding villages of Feckenham and Studley. Needle-pointing, scouring and polishing were all processes carried out by using water-powered machinery. In the late 19th century this mill was used for making malt for the Droitwich brewing industry, and in the early 20th century it had turbines fitted in order to generate electricity for Wychbold Court. Impney Mill is not recorded until the 13th century but the place-name is one of the earliest in the area, and if there was a settlement there from the 7th century and a mill is known from later times, it seems highly likely that the mill existed from well before Domesday Book. The first reference is to a fulling mill (a mill which processed cloth, see below) at Impney in 1292. Later, in a court case of 1586, two water mills ‘called Impney Mills’ are disputed. Further references continue through to the 1800s, with three water corn mills recorded in 1695. The mill(s) remained in existence through to John Corbett’s reshaping of Impney when in 1879 the ‘ancient flour mill’ was converted to a (probably larger) pump house which contained machinery to pump water from the well nearby up to Impney mansion (now Chateau Impney) and two turbines which used the flow of water to generate electricity for the new buildings. This building survives, converted to a house. Briar Mill is also first recorded as part of the possessions of the nunnery at Westwood, and was certainly in their ownership before 1272. It seems likely that this mill was there at the time of Domesday Book. The purchase by, or possibly gift to, Westwood of Middlemill from John Engleys is recorded earlier, and the site of this mill was very near to Briar Mill, whose acquisition is not separately recorded. The nuns also had rights of access across the bridge at Briar Hill (to Briar Mill) during harvest time. In 1272 Briar Mill and Middlemill were leased out by the prioress to William de Wunetone and Guy de Blakemore (it is possible that this reflects one building with two millwheels or two separate sets of millstones, or that the names were used interchangeably for the same mill.) After the Dissolution it passed to the Pakingtons. In November 1723 the occupier was Henry Tompson who surrendered the mill back to Sir John Pakington, its then owner. In December 1807 another John Pakington sold the ‘water corn mill called Brier Mill’ to William Brooke of Hartlebury. The Droitwich Town Mill is, like Impney, assumed to have existed from an early date because of the settlement’s continuing involvement in industrial-scale salt-making, which must have needed a mill to provide flour to make bread which would have been a staple food. It remained a detached part of Dodderhill parish down into the 19th century when the Tithe Plan so identifies it. It was used through into the early 20th century but was destroyed by fire in 1909. Assuming these are the 5 Domesday Book mills, it appears that Impney Mill served Impney, Ford and the area south of Wychbold; Paper Mill served Elmbridge, Crutch, the north part of Westwood and the area north of Wychbold; the first Wychbold Mill served central Wychbold; the Droitwich town mill served the two Wittons in Droitwich; and Briar Mill served the southern part of Westwood and the western side of Droitwich including the parish of St Nicholas. A fulling mill was built in 1474 at the end of Walkmill Lane. Fulling was a vital process in the production of broadcloth, converting a relatively loosely woven fabric into a close-knit one by soaking it in water and fuller’s earth and then pounding it by foot (the process was known as ‘walking’, hence Walkmill). Water-powered fulling-stocks, heavy wooden hammers, achieved the same result with less labour and greater efficiency. 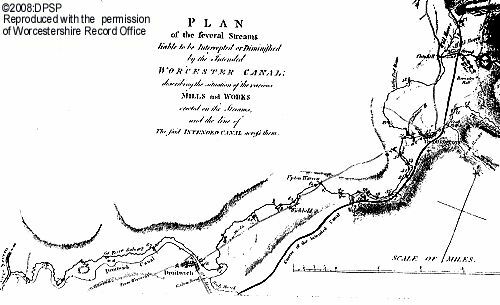 In 1786, there was a proposal to construct a Worcester Canal, which would travel from the north, through Clent Hills, Bromsgrove and Dodderhill. A plan was drawn of the route and a list of mills drawing water from local rivers including the River Salwarpe was included. Below is a section of the 1786 map showing the five mills in Dodderhill along the River Salwarpe. The original document may be found in Worcestershire Record Office.